One of Modern Times' staples, and nice to have a pale wheat in that part of the lineup. This is fruity, bright and vibrant, but with a pleasant wheat and malt undertone that drives the finish in an appealing direction. Had poured from pint can, delivered by my brother, into nonic pint. 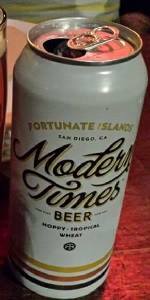 Although Fortunate Islands is bold and IPA-like in aroma and hop bite, by the balanced malt and traditional fruitiness it’s still recognizably an APA. 12/23/18 (Las Vegas, NV): $3.78 w/ tax 16 oz can, canned 7/1/18 purchased at Total Wine & More in Summerlin, poured into a large snifter. Golden murky pour, rich creamy head, heavy carbonation. Citrus and tangerine the predominate aromas arising from the hops. Light citrus hops taste, slight bitterness, crisp ad clean finish. Overall very good IPA. This beer just explodes with fruity aroma the moment you open the can. The Smells of tropical fruits is just incredible on this one. It has a kind of orange color, pretty hazzy with some sediment floating around in it. Not as carbonated as I would have prefered, but thats just me. It tastes as good as it smells, lots of fruity flavor, with a nice light wheat taste. Would highly recommend, this is an excellent brew. This beer pours a pale straw yellow with a little haze. The aroma and flavor feature citrusy/tropical hops along with some grassiness but overall it comes across as watery, almost like a session IPA. Not much wheat character, if any. Perhaps needs just a bit more malt.